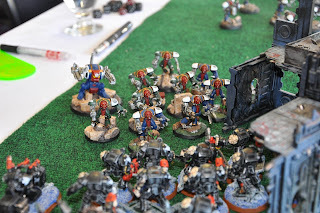 Report of Fallen on Falintime VI, 2 x Fallen have constructed an army of thinking machine called the "Legio Cybernetica". Elements of 1st and 2nd Company lead by Capt Belial and Interrogator-Chaplain Boreas. 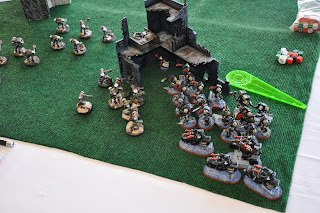 Prime Objective: The Fallen must be captured and force to repent at all costs! Secondary Objective: The distruction of all the heretical machines. This was a Deathwing (played by Paul Levy) vs RavenDeathwing. 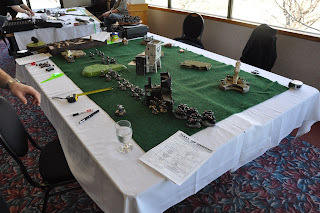 This was the final game at King Con II (Kingston's annual gaming convention), thanks again to the organizers for doing such a great job!! 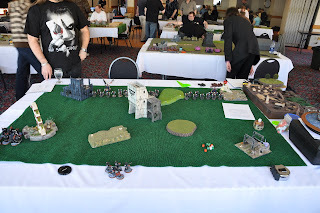 We were playing a normal game with the 12" deployment zone and each of us having an objective in our deployment zones. The secondary objective was one of the models or squads in the army was carrying crypto codes and by killing that model you got the codes. Paul gave the codes to the terminator squad he positioned on his objective and I gave mine to the Comd squad. Paul won the role for first turn and deployed across the length of the board. 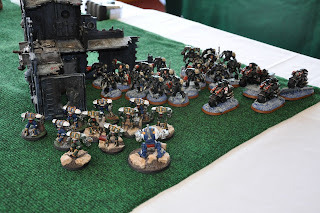 Given his deployment I wanted to use the Ravenwing to have the majority of my army fighting the smallest amount of his army. 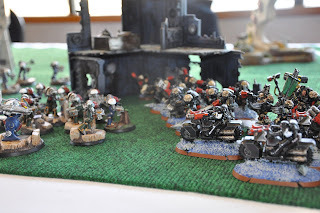 With both the objectives on my left flank, I focused there with all the bikes. With the latest FAQ for the main rule book, it is now ok for bikes with the scout special rule to turbo boost for their scout move. 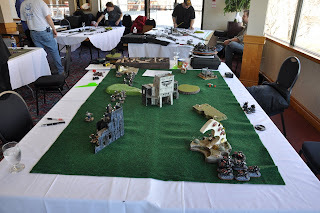 The Ravenwing zoomed across the table using the terrain to mask their movements as much as possible. I tried to steal the initiative but failed miserably with a 1. So the game commenced! 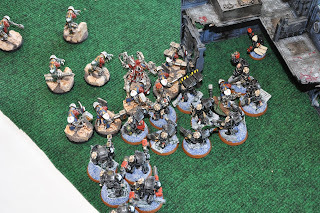 As expected the Legio's wasn't happy about these bikers sneaking around on their flanks, so they executed assault pattern bravo kill them all and moved into position to take out as many bikers as possible. They were successful in only killing 2 bikes but those bikes were the Sgt and a meltagun. That wasn't enough and the bikes now had visual confirmation of the Fallen. Time to call in the Deathwing. I deep struck 3 full squads (2 x Hvy flamer squads and the Comd Squad with Belial and Boreas). I made sure to position them so that the 2 Hvy Flamer squads would be be charged and allowed my Comd Squad to charge next turn. My remaining bikes swung around to engage the Dreadnought with their melta weapons with the atk bike's multimelta turning the Dread into slag. 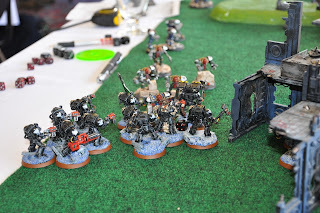 The the combined fire of 3 squads was enough to take down several of the blasphemis machines. The infernal machines began marching forward towards TFR. Several of the units who were woefully out of position. Legio Commander advanced with his squad of TH/SS while 2 other units of Cybernetic monstosities moved to trap TFR in the center. One of the inital Legio squads attacked the closest TFR squad killing 2 but losing 3 of their own in the process. Another terminator squad zeroed in on the homing beacons produced by the bikes and teleported in to provide supporting fire. 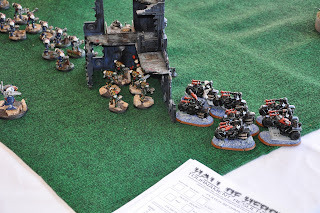 The bikes repositioned to deal with one of the flanking squads and brought a TFR Hvy Flamer squad with them. Belial yelled a war cry and the Comd Squad rushed forward into the Legio's TH/SS squad lead by the mad tinkerer. In the ensueing hand to hand both Belials died along with the entire TH/SS unit leaving Boreas directing the battle on behalf of TFR. With the right flank of the Legio destroyed the Cognitor engines attempted to stop the crushing advance of TFR. The remaining Dreadnought advanced towards the biggest concentration of enemies killing one with his lascannon. The remaining Legio units advanced towards the same concentration. 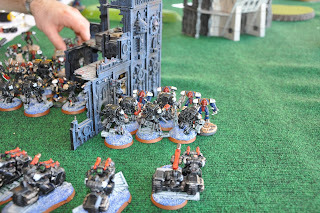 Bother Lazarus one of the Hvy Flamer terminators continued to fight on despite losing the rest of his squad in combat. 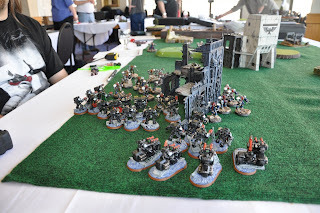 The bikes of the Ravenwing rush forward again to take down the remaining Dreadnought. They are sucessful and the massive killing monstrocity suffers a violent explosion. Boreas leading the Comd Squad charges across the open plain and starts ripping apart another unit of blasted machines. The charge is so devistating it wipes out the entire squad. With the loss of all command the machines continue to execute their last programs and continue advancing on the highest concentration of enemy. The are to far for hand to hand and their shooting is ineffective. Boreas leads the Comd Squad on another decimating charge, eliminating all of the cursed machines and ensuring the capture of both Fallen. 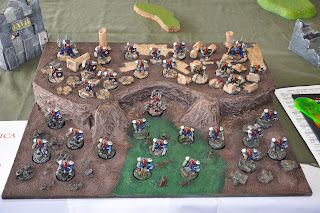 I had a blast playing this game, Paul was fantastic and with a different deployment this would have been a very different game. I hope I get the chance to play against him in the future. 2 x Fallen recovered. Interrogation commenced. Capt Belial, expected to make recovery.